Born October 15th 1988 in Gelsenkirchen, Germany of Turkish decent, Mesut Ozil plays for Arsenal and the German national team. Mesut started his youth football career at different clubs in Gelsenkirchen and then played for five years for Rot-Weiss Essen. By 2005 he had attracted the attention of Schalke 04 and went on to make 30 appearances for the side. Ozil signed for Arsenal at the start of the 2013-14 season for a 42.5 million which made him the most expensive Arsenal and German player of all time. Werder Bremen moved for Ozil in January 2008, paying 4.3 million Euros for the play-maker and central attacking midfielder. He featured for both the German U19 and U21 teams before making his debut for the national team in 2009. Ozil burst on to the international scene with his performances at the 2010 World Cup, which helped Germany to finish third at the tournament. He was individually nominated for the Golden Ball Award for best player at the tournament. Those performances sparked interest in his services across Europe with Premier League sides as well as both Barcelona & Real Madrid mentioned. 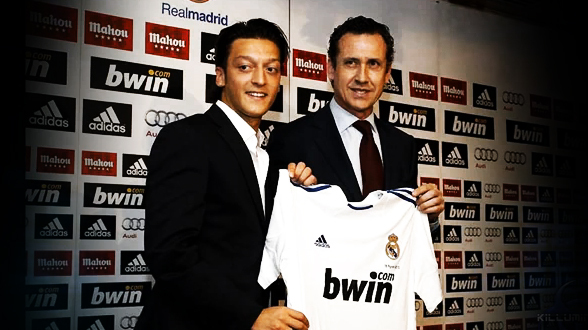 In August 2010 it was announced that for a fee of 15 million Euros Ozil would join Real Madrid where he plied his trade for three seasons before making the high profile switch to North London to wear the red of Arsenal in a club record deal of £42.5m.